The Ironmaster Super Bench exclusively at Sport-Tiedje! The Super Bench weight bench of the renown manufacturer Ironmaster has been well-known in the US since a long time. The very sturdy and 11 times adjustable bench is of versatile use. By means of some accessories (chin up bar, biceps curl pult, dip bar, etc. ), the Super Bench can be transformed into a very compact multi-gym. The sturdiness of the bench features a well-padded surface and a maximum user weight of 450 kg all in all. 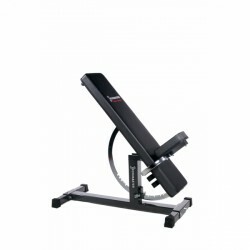 The simple adjustment mechanism offers classic weight training in flat and incline bench mode as well as abs and back training. The Ironmaster Super Bench can be used as very sturdy weight bench and as home gym on smallest space with respective accessories. Very nice bench. But for home fitness the weight of the bench is too much. However worth it. Ironmaster Organizer / stand for accessory In stock! Ironmaster dumbbell racks (in pairs) for Super Bench weight bench In stock! Stand Unit for Ironmaster barbell rack for Super Bench In stock!